One of the big advantages of being settled back in Dublin, with book shelves once again, is having all my old cookbooks to pore over and rediscover. Although I did manage to build up a fair collection in New Zealand, it couldn’t really compare to my beloved stacks of books by Nigel Slater, Darina Allen, Tamasin Day-Lewis, Nigella Lawson and my ancient copies of Paula Daly’s McDonnell’s Good Food Cook Books. The first and second books in this series, bought from saving up the tokens on Stork Margarine packets, were two of the first cookbooks owned by my mother. Every recipe, of course, used Stork Margarine – they were first printed in 1976, long before Darina Allen started turning the Irish nation back into butter lovers – and just leafing through them is an exercise in nostalgia. As a child I cooked my way through Drop Scones, Frangipane Flan, Steak Diane and Melba Toast, while a picture of The Runaway Train children’s birthday cake furnished many hours-worth of dreaming. I subsequently made this for a cousin who probably was too young to appreciate more than the Liquorice Allsorts used for wheels and the Smartie cargo – it’s not really a cake worth returning to. But many of the recipes, albeit with Stork swapped for butter, definitely are. Every Christmas Cake in our house was, and still is, covered with Almond and Royal Icing according to the tables in the first book. I learned how to make choux pastry from the step-by-step photographs when I was about eleven and subsequently became famed for my Chocolate Éclairs. Family get-togethers were normally preceded by several days of Éclair-making when I took over the kitchen and most of the freezer (and probably my mother’s nerves!) to make what I considered a sufficient supply – normally 2-3 per person. While I haven’t made Éclairs in years, I have returned to several other of the recipes, with a few modern updates, to great success. The Sausage Plait pictured on the cover was a particular favourite when I was younger. One day I cooked it on the shelf below one of my mum’s Apple Tarts and, although I initially thought it was ruined when the tart’s sweet, appley juices overflowed on top of it, the apple flavour actually complemented the pork so much that I now add apple to the recipe. It’s a great supper dish, especially with a good accompanying salad, and it also travels very well as part of a picnic spread. Preheat the oven to 190°C. Roll out pastry into a 30cm square on a floured worktop. Using the rolling pin, lift the pastry carefully on to a large flat baking sheet. Put the sausagemeat, onion, garlic, ketchup, thyme, tinned tomatoes and grated apple into a bowl and mix well. Place the filling mixture down the centre of the pastry, leaving a margin of 10cm on each side. Cut diagonal 2.5cm strips each side of the filling. Take each strip and plait it across the filling, alternating sides. Tuck in the ends neatly and brush with either beaten egg or milk. Bake in the preheated oven for 30-40 minutes until well risen and golden brown. Serve hot or cold with plenty of green salad leaves. Serves 4. “I learned how to make choux pastry from the step-by-step photographs when I was about eleven and subsequently became famed for my Chocolate Éclairs.”Me too!They are fantastic. my mother won’t part with her originals, but the best of went on sale a few years ago and she has several copies to pass on when she feels like it.The Brown one is the best. By the time the 4th (the green one) Daly seems to have ran out of the staple recipes and turned to low fat foreign cooking.The thing about her is that every bakery item is perfect, regardless who makes them. Me too, I’m always dividing recipes by 25/30 to get an idea of how many oz I’m using.Her pastry is flawless as is things like pavlova, victoria sponges and Hedgehog cakes – they are still my height of cake decorating. That and the swiss roll you could make in to a train.I remember once liking recipes (from the red one, I think) like fishfingers in bought soup – they were under the quick family tea section. My father brought them up recently while talking about the things we forced him to eat. They were his least favourite.That and a spectularly burnt batch of oatmeal biscuits that my sister said were “golden”! Ugg…those fish fingers sound awful – I can well understand your father not being impressed with that dinner! I think Paula must have run out of ideas as time went on but all of her best recipes are definitely in the first brown book. There’s lots of them that are totally seventies throwbacks, though, aren’t there? When was the last time you were offered Steak Diane? I think that was one of the first Sunday lunches that I cooked my parents – god bless my mother’s nerves! Hi there,My mum is a big baker and was devastated to lose her Stork cookery book! It was a book she had in school and has been unable to source one anywhere at this stage.She loves making all sorts of cakes like coffee, chocolate and cheesecakes. Would it be possible at all to have a look through your books to look for a recipe for buttercream in the Paula Daly Stork books please?She has tried a number of other receipes but it just come out the same. Thanks! Sorry Marie – didn’t realise that you had left this comment until now. I’ll definitely take a look for that recipe. [Updated 22 Aug, 2007] Marie, would this be the recipe that you are looking for? It’s under Vanilla Icing in the first cookbookVanilla IcingMargarine – 75g (3oz)Icing sugar – 225g (8oz), sievedMilk – 2-3 tablespoonsVanilla extract – ½ teaspoonPlace all the ingredients in a bowl and beat well until smooth. I have just found this site after ‘Googling@ Paula’s name. Is their anyone out there in Ireland that has one of the Stork receipe leaflets that used to come out at Christmas, that contains the receipe for her chocolate cake containing ‘Golden Syrup and , l think, ground almonds. It was gorgeous. I have searched high and low, with no success to find my, by now, dog eared copy, and rue the day l never made a copy of it, or scanned it into my computer. I would be eternaly greatful and will pay postage or any costs incured. I think it must be at least 15 to 18 years a go it was printed.Many Thanks,Elizabeth Kavanagh,Waterford. Please help, I have lost my favorite recipe for Mc Donnells All-In-One Rich Sweet Pastry and was hoping to make my mince pies to share with my friends . Hello everyoneNot sure if anyone will be reading this, as the last post was some time ago. I had two Stork Christmas recipe leaflets of Paula Daly’s – I was living in Ireland in the 80s and have used the recipes ever since. I moved recently and can’t find the leaflets! My daughter and I intended to make the mincemeat, Christmas cake and pudding – and of course the recipe for shortcrust pastry was the best. Does anyone know where I may be able to track down the recipes – I’ve searched online but with no luck. It’s interesting to read above that Paula Daly produced cookbooks, but of course they are not on Amazon.ca (I live in Canada now) nor Amazon.com.Any help would be appreciated – those recipes are the best I have ever used for Christmas baking. A quick ps to my previous post. If I find the recipe leaflets (strange they were not with my other cookbooks) I will be happy to copy them out for everyone who has been searching for them. I am so sorry – my own copies got temporarily mislaid so it’s only now that I’m able to get looking for these! I’m going to do up a proper post with all the recipes I can find in it. @Elizabeth, Teresa and Christina – I don’t have the Christmas booklets but I’m going to go on a big search this weekend in my mother’s piles of old cookbooks and hopefully something will turn up. Fingers crossed! Hi, Please does anyone have a recipe for a McDonnell’s All in one Method for a Harvest Fruit Loaf. 2. Place half the flour mixture in a bowl together with the Stork and beaten egg mixture. 5. Knead lightly until smooth. Place in polythene bag or wrap in cling film and leave in refrigerator for 1 hour. thatks for posting this… back to baking now……. Nothing worse than losing a much-loved and well-used recipe. Happy baking and a big thanks to Ro for posting the pastry one above. Harvest Fruit Loaf (I’ve been baking it for 38 years. Got the Stork recipe from my mother)4ozs Stork marg. (room temp. )4ozs Caster Sugar2 large Eggs8ozs Self Raising flour1 level teaspn mixed spice (I sometimes add ginger also)1oz cherries10ozs Mixed dried fruitquarter pt milk less 3 tablespoons.Place all ingredients in mixing bowl and beat with a wooden spoon until well mixed (2 – 3 mins.). Place in loaf tin lined with baking parchment. Bake at Gas 3 for 40 – 50 mins (until a wooden skewar comes out clean when inserted into cake). Leave in tin for 10 mins. Turn out and cool. Enjoy! Bought the book on Maarktplaats (Dutch ebay) because of the name McDonnell!….also happens to be my family name! I am looking to buy all four of the McDonnell’s Good Food Cook Book’s. 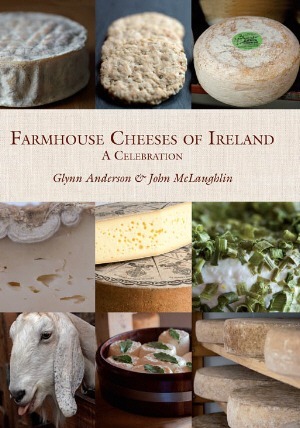 Does anyone know where I can try in Ireland? All I have is the Dundee cake receipe from one of the books (its very nice for a Christmas cake!) I have tried the usual, Ebay, Amazon etc but no joy… Does anyone know the authors name? Paula Daly was the author of the cookbooks but they seem to be fairly difficult to find. I picked up my copies in charity shops around Dublin where I also managed to source replacements for my mother’s illegible originals. Good luck with your search – I’d love to know how you get on! I wish they would re-publish these books – so many people seem to want to get their hands on them. What’s the third book like? This Leaflet is called Christmas Baking with Stork and shows a fireplace, stocking and tree on the front along with some pictures of plum pudding, santa buttons, banoffi, and mince pies. I would be happy to share any of these recipes or any from the brown book. If anyone knows where I can get copies of the other books in the series, I would appreciate it. Wouldn’t it be great if they republished it 🙂 Anyway, with Christmas baking just around the corner, I hope this helps. Thanks for that, Ro. It’s funny that they haven’t reissued these books – yet. Might have to get the thinking cap on, Ro! I have just found your blog, it is so interesting, you are definitely being added to my favourites list. 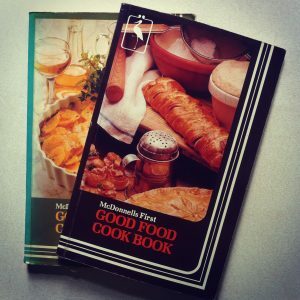 The article on the Mc Donnells Good Food Cookbooks brings back many memories. I have all four copies and would have used them regularly when my children were young, the chocolate house cake was made for birthdays on several occasions, and I always used them for the Yorkshire pudding recipe as I could never remember the correct amounts without checking the book. That Yorkshire pudding recipe was a regular in our house too, as was the one for pancakes. Not so easy to find though. The indexes in those books weren’t the easiest to use! For those looking for Mc Donnell’s good food cook book, I just saw the Brown and green books in Chapters, Parnell St, Dublin 1. Wow! New or secondhand copies? Thanks for passing the information on, Jessica. This post just made me smile…as my mother had this brown recipe book…which i acquired when she died and the best thing about it was the shortcrust pastry recipe ratio…it made the best pastry ever and every time i made an apple pie it was just like my mum had made it….true comfort..unfortunately i have mislaid this book somewhere in the house but i have just messaged my cousin in Ireland to find my Aunts copy…it seems every woman in Ireland owned one, and they all had bits of magazine recipes shoved into it ha ha ha….brilliant recipe book and so lovely to see that so many of you also have it or are searching for one because of the sentimental attachment. It’s a great book, Rachael – all you need to do is exchange the marg for butter and you’re set! If you ever need a recipe from it, let me know. As you say, every woman in Ireland must have owned one: I’m just surprised at how few appear in secondhand book sales or charity shops. Too good to throw away! Was it a recipe for a chocolate biscuit cake, Lorraine? Will check the book when it’s next at hand! Found it, Lorraine! Here’s a link – McDonnells Good Food Cookbook by Paula Daly, p47, with recipes for Honey Nut Ring Cake, No Bake Chocolate Cake – just click on the image on that page to make it easier to read. Enjoy! Where can I get these books please? They only seem to be available in second hand shops or charity shops these days, Anne. They are fantastic books, Marie. There are evidently lots of people still cooking from them! Hi, I hope someone can help me in my search for a Stork chocolate truffle recipe. It was in one of the Christmas booklets many years ago. It had chocolate, ground almonds, butter, icing sugar and, of course, Stork. I can’t remember the quantities though. Would be so grateful if anyone can help. really enjoyed all the comments on Paula dalys cooking recipes I have just I book going back to the seventies it is brown and cream now I’m after coming to Brussels for my grandsons birthday and intended to make the train cake with all sorts and smarties have most of recipe but have forgot how to make the coconut with the green colouring as I did not bring book with me suppose I will have to work something out. There are actually no instructions for that green coconut in that recipe, Helen. All you need do is mix some dessicated coconut and green colouring together until you have the desired shade. Hope your grandson enjoys the cake! I know this is an old post but wondered if anyone had the recipe for the whiskey ring cake its mentioned here but no recipe Id really appreciate it if anyone is still checking out this post. I’ve found a recipe for a Frosted Ring Cake in the original book – is that any use? Those cookbooks have certainly been well used by many people over the years! Lovely to hear how you’ve enjoyed cooking from them.